Because it strikes me, especially in this section right after the Sermon on the Mount that everything Jesus does highlights Who Jesus is. Everything Jesus does is kind of like an argument for Who Jesus is. Like last week when Jesus healed the paralytic and at the same time forgave his sins. Remember that? 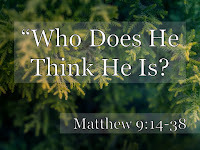 Who does Jesus think He is going around forgiving sins? Or the week before that when Jesus spoke to the storm and it had to obey or when He spoke to the legion of demons and they had to obey? And all that time, Jesus continually keeps calling people to follow Him. And live a life of discipleship. Now in the middle of all of those miracles and invitations to discipleship there is a little story that is kind of different from all the rest. Some friends, some allies, disciples of John the Baptist who was, if you remember, in prison at the time, [these disciples of John the Baptist] come to Jesus and have a question for Him. And I don’t think it’s an attack. It’s not a trick question or a trap. At least, I don’t think so. It’s not like the kinds of tricky questions that the Pharisees ask to try to trip Him up. Fair question. And Jesus chooses to answer their question by telling us all just Who He thinks He is. If you remember, last week, we left Jesus at a party. There was a big party at the house of Matthew who had just recently been a filthy rich tax-collector/extortionist. And at that party were a bunch of current tax-collectors and notorious sinners. And Jesus was eating with them. He was spending time with them. He was enjoying their company and loving them. He was extending mercy to them. He was calling them to repentance and faith and salvation and discipleship. Because they needed it. He was a sin-doctor, and they were sin-sick. But they were doing all of that over dinner. Feasting and eating and enjoying a big meal together. And then Matthew tells us that John the Baptist’s disciples were scratching their heads. Remember, John the Baptist was famous for eating locusts and wild honey. He wasn’t big on lavish dinners at the Golden Corral. In fact, his followers had been taught how to fast. So they come to Jesus in verse 14. We are known for fasting. The Pharisees (who tend to know their Bibles) are known for fasting. You guys? Not so much. Before we see how Jesus answers. Let me you ask you how you would answer that one. It’s not like Jesus never fasted, right? I mean He holds the world record. 40 days and 40 nights. We watched Him do it back in chapter 4. And He’s taught His disciples how to fast. We read about it in the Sermon on the Mount chapter 6, verses 16 through 18. But fasting was definitely not what Jesus was known for. Instead, they’re eating. They’re drinking. They’re feasting. And they don’t have somber looks on their faces. They’re not all sad and fasting and depriving themselves. I mean they probably did it on the Day of Atonement like the Law said to. But that was about it. Most of the time, they were enjoying themselves. I mean, the Pharisees were probably fasting for all of the wrong reasons. They were the poster children for doing it the wrong way. They were fasting to be seen by others. They were the targets of Jesus’ critique in the Sermon on the Mount. They already had their reward for other so called acts of righteousness. But the disciples of John were good guys, right? They probably fasted out of repentance and sorrow for their sins. John taught people to repent for the king was coming and the kingdom of God was near. That’s probably a big part of why they were fasting. 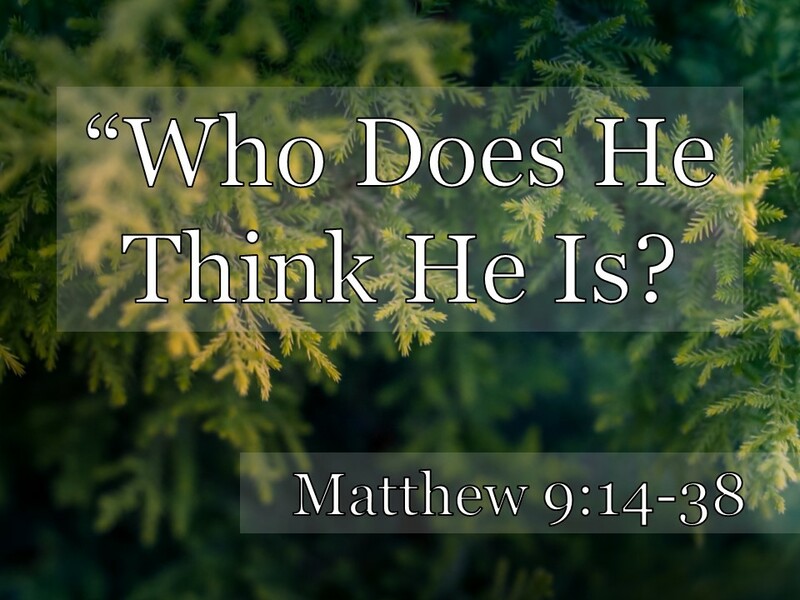 And Jesus answers by telling them Who He thinks He is. Jesus liken Himself to a bridegroom at a wedding. Do you get his analogy? His question is should everybody be all sad at a wedding? Have you ever been to a wedding? How do people act around the bride and the groom? No. If they are, that’s not the kind of wedding I want to be at! No. Everybody is insanely happy for the couple. Aren’t they? Big smiles. Break your face smiles. Ear to ear grins. And lots of feasting. Lots of joy and rejoicing. Jesus says that’s what it’s like to have Him around. We aren’t living in the John the Baptist days where the king is coming. We are living in the Jesus days when the King has come! Do you know who also talked like this? John the Baptist, right? In the Gospel of John chapter 3, John the Baptists basically says that he’s the best man at the wedding. But Jesus is the groom. He says, “You yourselves can testify that I said, 'I am not the Christ but am sent ahead of him.' The bride [which is the church, right? The people of God.] belongs to the bridegroom. The friend who attends the bridegroom waits and listens for him, and is full of joy when he hears the bridegroom's voice. That joy is mine, and it is now complete. He must become greater; I must become less” (vv.28-30). It’d be pretty inconsistent for Jesus and His disciples to major on mourning when they are announcing the inbreaking presence of the kingdom of God! Now is the time to rejoice. Because Jesus is the Bridegroom. But I also think it’s true right now when the bridegroom is in heaven and we’re waiting for His return. So rejoicing is appropriate because we have the King and we have the kingdom. But right now lament is also appropriate. Because the King suffered and knows our suffering. And right now LONGING is also appropriate. Because we don’t have the King right now. He’s not here right now in all of His fullness. We are WAITING for His return. When we get to the end of the Gospel of Matthew, Jesus is going to use this language again to talk about watchfulness. He’ll liken Himself to a Bridegroom who may come at any time, and how we need to be ready for Him. That’s Who Jesus think He is. And you know that’s a big deal? Because do you know Who the bridegroom is in the Old Testament? God Himself. Read Isaiah 62 this afternoon. Read Hosea chapter 2 this afternoon. God refers to Himself as a bridegroom. A bridegroom is full of love. A bridegroom comes to get His bride. And wherever the bridegroom is, there is JOY. So should we fast today? Well, we shouldn’t fast like the Pharisees. Nobody should fast like that. And we shouldn’t fast like John the Baptist’s disciples. Because we don’t live in that era of anticipation in the same way they did before. But we are free to fast today because we have the Bridegroom and yet we are also still waiting for the Bridegroom. So we have joy but we can also lament and we should also long for the return of Christ. If that’s what our fasting means, then we probably should do some of that today while we wait for the bridegroom to come. And he says, “In this age there is an ache inside every Christian that Jesus is not here as fully and intimately and as powerfully and as gloriously as we want him to be. We hunger for so much more” (pg. 38). And that’s because Jesus is the Bridegroom. The picture is pretty clear. You don’t use the old with the new or things break and go wrong. A new piece of cloth will shrink and re-tear the mended garment. They don’t go together. New wine will ferment and rupture a brittle old wineskin. That’s not a chemistry experiment you want to watch. You need new for the new. I think that Jesus is saying that the old kind of fasting (like the John the Baptist’s) doesn’t work now that Jesus has come. The Pharisees fasting certainly doesn’t work these days. If they thought that they were impressing God with their acts of righteousness. It don’t work that way. And never did. But the new has come. Jesus has come. The king has come. The Bridegroom is here. If we’re going to fast, it needs to be a new kind of fast. One that keeps all that mind. Do you think that Jesus can raise a dead girl to life? For twelve years she has had this recurring problem. And as uncomfortable as it was, it also made her UNCLEAN. Right? Ritually unclean. She might as well have been like the leper in chapter 8. It comes out in her courage. Amazing power! Amazing faith! She never had that problem again. But that’s the not main story. Remember where Jesus is headed. You don’t call in the professional mourners unless the person is totally dead. She wasn’t just mostly dead. She was totally dead. But Jesus says that her death is just like sleep to Him. She’s going to get up again today. #2. THE RESURRECTION AND THE LIFE. He thinks He’s the resurrection and the life, doesn’t He? I mean He doesn’t say that here. Like He will at the tomb of Lazarus. But that’s what He’s saying, isn’t it? Jesus is saying that He turns death into something just like sleep. That He can wake someone up from death. And this ruler guy, the other gospels tell us his name was Jairus, He believes it. Do you believe that Jesus is the resurrection and the life? That Jesus can wake people up from death? I love that Jesus does this not for some bigshot. I mean Jairus might have been a bigshot, but this is his daughter. It wasn’t his son. In that culture there was a big difference. Jesus is healing helping the last, the least, and the lost. There was nothing more unclean than a dead body. Uncleaner than an issue of blood. In John 11 Jesus said, “I am the resurrection and the life. He who believes in me will live, even though he dies; and whoever lives and believes in me will never die. Do you believe this?” (vv.25-26). He thinks the same thing that these blind guys do. He thinks He’s the Son of David. He thinks He’s the Messiah. They want Him to heal their blind eyes. This afternoon when you’re reading Isaiah 62, look also at Isaiah 35 and see what things will be like when the Son of David, the Messiah comes. When God comes and makes everything beautiful again. It sounds like what happens when Jesus comes to town. These guys did! And they couldn’t keep it a secret. Even though Jesus told them, too! Jesus didn’t need the extra publicity, but they couldn’t help but tell others that they had been blind but now they could see! “Shots fired” as they say. They couldn’t argue with the miracles. But they could dispute the meaning of the facts. They had to dispute the meaning of the facts or they would have to put their faith in Jesus as the Messiah! Instead they said that Jesus was a tool of the devil. Jesus is asking the same question of us today. These kinds of interactions are going to lead to arrest, trial, and crucifixion of our Lord. Jesus will have more to say about this in chapter 12. Right now, what’s important is to see that Jesus is asking us to believe in Him as the Messiah. Because He’s what we need. We just looked at this passage a few weeks ago before the Good News Cruise. So we won’t over it again. But we can see Who Jesus thinks He is. He thinks He’s the answer to these poor people’s problems. He thinks He’s the shepherd these sheeple need. Is that how you see Him? Jesus said, “The thief comes only to steal and kill and destroy; I have come that they may have life, and have it to the full” (John 10:10). And here He says, “As the Lord of the harvest” to send people out to bring them in. Jesus is everything we need! If we have Him, we shall not want. [Matt's Messages] "Our Greatest Problem"